If there's one thing that sticks out about the Tekken games it's the diverse cast of characters. This is one of those games where you just accept the fact that a panda bear and an old scientist are street fighting with a raptor wearing boxing gloves and a fire breathing ogre with snakes for an arm that in no way resembles Shrek in the slightest. Each character has a unique and interesting fighting style and the game was a fun way for me to learn button mashing in order to beat my brothers. I was introduced to Tekken when I watched my cousins play Tekken tag for the first time. When it was my turn to play I thought it was kinda bland. The game finally clicked with me when things got weird. Someone chose to play as King, the guy with the motionless wildcat head. As soon as I saw this ridiculous cheetah wrestler guy fighting some barely dressed girl in a random shopping mall I had to have this game. I wouldn't get to play again until years later when I got a hand-me-down PS2. In the time between I played various Tekken games in arcades whenever I spotted them. The fighting felt awesome and every character was a blast to play. For me, this was one of those games where choosing random player and computer opponents each turn every round would be fun for a couple hours. I drifted between multiple favorites and played through every mode in Tekken 5 with everyone. Out of all of them I'd say Tekken Tag 2 had my favorite roster, and by that I mean virtually everyone in the series. And what boy could forget seeing half naked chicks with stunning PS2 graphics for the first time? Characters from Tekken inspired many of my drawings in 4th - 6th grade. The idea of a DBZ crossover possessed me to draw too many pictures of these muscle bound characters fighting each other. Kazuya vs Vegeta and Jin training with Gohan for the next tournament were thoughts that swam through my head during grade school art class. My first attempt at drawing a female Tekken character taught me that I was physically incapable of capturing the beauty of the female form with pencil and paper. The Devil within adventure mode starring Jin was also a really fun diversion. I really wanted a more fleshed out version of that after playing it. A game where you run around fighting robots as a martial arts god with the power to turn into a winged & horned semi-beast with laser eyes sounds like the greatest idea ever. And what was with that crazy Star Fox looking game that plays every time you start up? That mix of weirdness and mystery is what makes Tekken so special to me. It goes off the wall all the time because just a straightforward fighter would be boring. Toss some wacky animal characters in there. Have some supernatural elements. Put hot chicks in it to mess with my young hormones. And have an arcade history mode with the first 3 Tekken games and the full version of StarBlade just because. Games don't have that kind of cool stuff these days. The Tekken characters are really iconic to me (some more than others) and my eyes are programmed to light up whenever I see one of my favorites making an appearance. For some reason my love for Heihachi increased when I played him in some Pac-Man party game I can't even remember. He became even cooler to me in Tekken 5 where the story revolved around him being assassinated and people were fighting for his position. Heihachi and Devil Jin were always my favorite but playing Tag 2 now, I like Ogre and Scientist for fun and Marshal Law when I'm playing to win. I also liked the custom character editor. 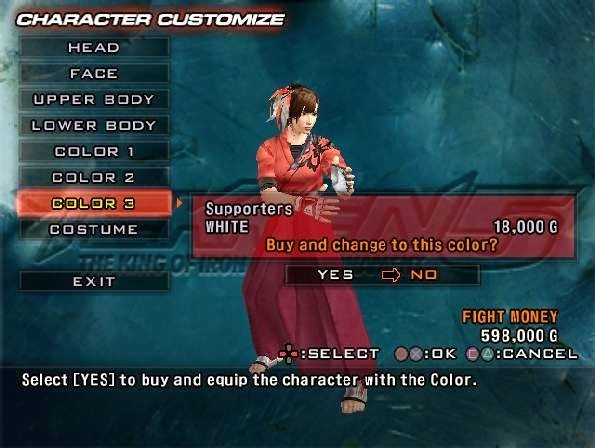 What helped make Tekken more exciting than Mortal Kombat for me was the ability to customize characters and gain a sense of progression, something I never saw before Tekken 5. You earn money by climbing the ranks in a endless arcade mode which became an addictive thing for me. I had to have all my favorite characters at the highest rank possible even though I was the only person who'd ever see my rank and it wasn't online. The ranked matches were all with computer fighters but it felt like the online experiences we have today. This was my first taste of climbing leaderboards to be the best. Tekken will always have a special place in my heart as the 3rd fighting game I ever got into and the first to show me a little bit about gaming history via the arcade history mode. It gave some perspective as to how advanced games have become over the years and likely planted the seed in my head that grew into a desire to become a 3D animator, eventually leading to where I am now.